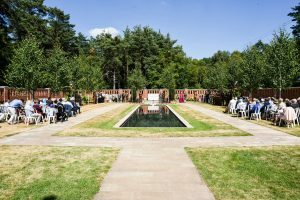 RELIGIOUS, military and civic leaders came together at Woking’s Muslim Burial Ground Peace Garden Sunday to honour all the Muslim soldiers who gave their lives for Britain in both World Wars. The service at the site on Horsell Common, also marked the anniversary of the first soldier, Shaikh Abdul Wahab, who was buried there on 16 July 1915. There were addresses by Sophina Chisembele, daughter of last soldier to be buried in the Muslim Burial Ground, John Kingsbury, Armed Forces Champion, Muhammad Jawad Ajmal, Second Secretary, representing the High Commission of Pakistan and Colonel Simon Browne, Deputy Commander of 11th Infantry Brigade. In addition there was a laying of wreaths by the Mayor of Woking, Cllr Will Forster, and Col Browne.